This holiday season give the gift that keeps on living and help steward trees in the Middle Fork Willamette watershed. We have done the math. On average it takes $3.00 to care for a seedling so it survives and thrives in the first five years. 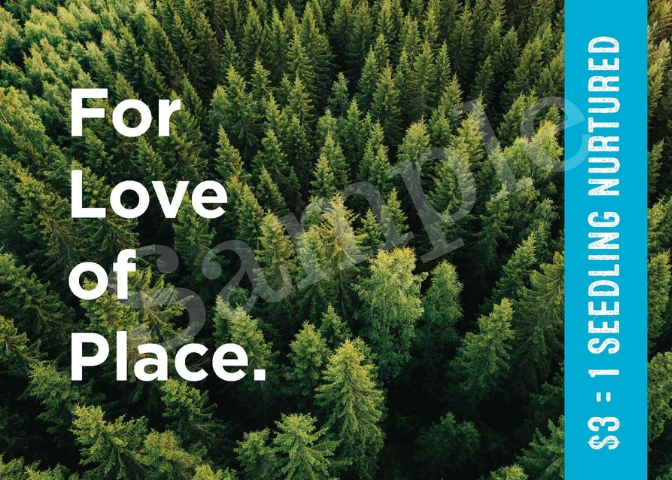 100% of this donation (minus any transaction costs from online donations) will go into a stewardship fund managed responsibly by us that will be used to nurture native trees and shrubs that have been planted for the benefit of people and wildlife. Your donation will help care for seedlings and help them thrive. In return we will either mail or email you a certificate to share with your gift recipient. Want something a little extra to share with those you love (or keep for yourself)? Donate $60 dollars and receive our new Waldo Lake T-shirt! Just leave a comment on your donation letting us know what size you would like. Please allow up to 48 hours for the delivery of the paperless post certificate and up to a week for the postcard. In thanks for your gift we will send this certificate of support either by mail or email to your gift recipient! 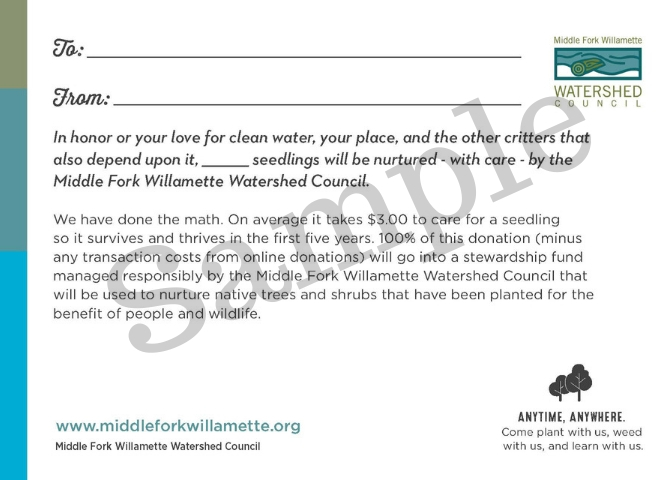 The Middle Fork Willamette Watershed Council is a 501(c)(3) organization EIN 26-0813058. You may take a tax deduction to the full extent allowed by law for this donation. No goods or services were given or sold to you in exchange for this contribution, except for the knowledge that you are helping make the Middle Fork Willamette watershed a better place to work, live and visit!